PD Ports has signed a multi-million pound five-year bulk handling contract with plaster and plasterboard products manufacturer British Gypsum at Teesport. 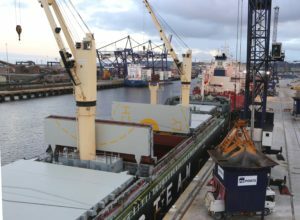 British Gypsum will bring shipments from Europe directly into Teesport every two weeks where it will be stored in a new bulks warehousing facility. British Gypsum will also make use of Teesport’s dedicated rail terminal directly linked to the bulks facility, which run six days a week.